Arcadia Lakes, located on the northeast side of Columbia, South Carolina, which is centrally located in the State. The community was founded in the 1880’s on the former Douglas Mills tract of land, a mass of over 2000 acres in size. Seven lakes are interspersed in the community adding to its appeal. The community is bordered by Two Notch Road to the northwest providing residents easy access to any of the three interstate systems in the area, I-77, I-20, and I-26, as well as downtown and northeast Columbia, SC. Residents can access I-77 and be in Charlotte, North Carolina in little more than an hour or hop on I-20 north and find Myrtle Beach, South Carolina less than 3 hours away. With such a vast interstate system, residents can head any direction and have easy access to any number of large cities. 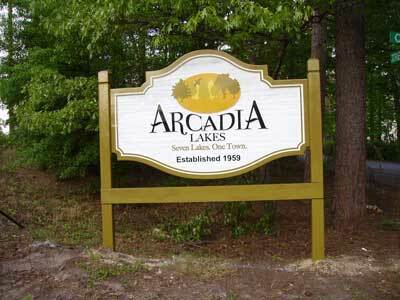 Arcadia Lakes, which was designated a town in 1959, grew from a population of 316 in 1960 to well over 3500 today. Many of the residents in Arcadia Lakes are located on or within view of one of the several lakes found in the community. Homes in the area range in value from as low as $175,000 to over $500,000 and include amenities such as pools, screened in porches, and rooms with fabulous views. Some of the lots have acreage included allowing for a more rural feel to the environment. Sizes of the homes range in square footage from just over 2000 square feet to almost 5000 square feet. No matter what you are looking for, Arcadia Lakes has a home for just about anyone. The location of Arcadia Lakes allows residents to access downtown Columbia, SC or the new Villages at Sandhill by way of Two Notch Road. Downtown Columbia allows access to collegiate activities, museums, and numerous outdoor activities. The Villages at Sandhill north on Two Notch Road includes a vast array of shops and dining experiences, with a Farmers Market being held once a week at the Clemson Sandhills Research and Education Center across Clemson Road. Sesquicentennial State Park is also nearby and provides access to hiking and biking trails, as well as a lake for fishing and swimming during warmer weather. Arcadia Lakes is also close to both the Forest Lakes Country Club and the Rockbridge Club, providing access to swimming, tennis, and golf, as well as other social activities. No matter what you might wish to do, Arcadia Lakes is close to just about everything.